It's MSRP now, no longer $20. And it's not 10% off digital, Ubisoft did the same thing with the Gold edition of AC Origins. They made the digital version $10 cheaper essentially charging you for the Steelbook. Also you can't pre-order the retail PS4 gold edition at either retailer. What gives? i couldn't decide, so I just went with the Gold. $80 and $10 towards a future item. I usually don't go with the gold/deluxe, but since FC3 is included, I bit. I haven't played that one yet. Best Buy finally had the Gold PS4 version up for pre-order. Sold! I have never played a Far Cry game before, but this one is looking pretty good. I am planning on buying it day 1. it looks like they are using the perk system from AC0. Target shipped out my copy. Can't beat $66.01 for the gold version. 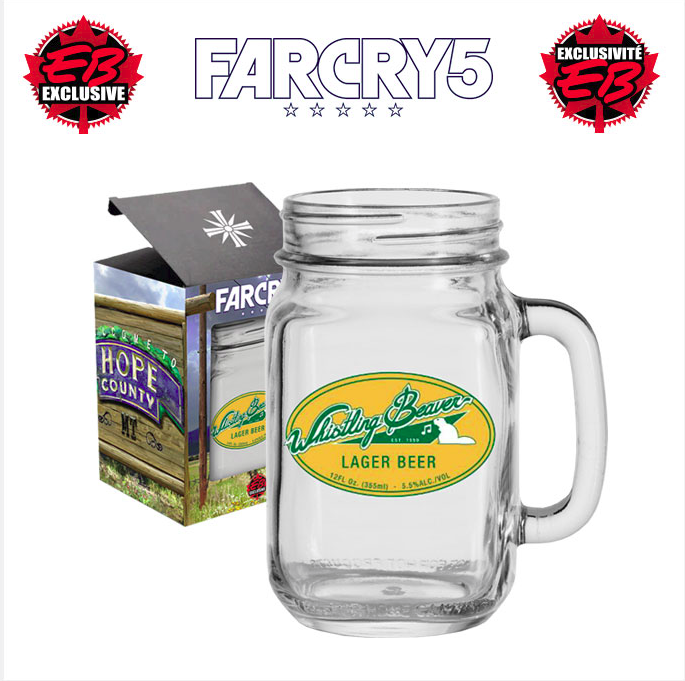 In-store purchases get a mason jar cup and keychain. Do yourself and favor and play FC4 at a minimum. It's excellent. I preferred FC3. I played FC3 and FC4 fairly close to each other, and FC4 just seemed to be more of the same. Both better than Primal though. That one blew IMO. Yeah, the gyro-copter is what put FC4 over FC3 for me - sometimes I'd just fly it as close to the top of one of the towers, and jump out near the top. Hell, I thought (briefly) about actually trying to build one. does anyone know if GS will have a midnight opening for FC5? I guess, similar to Far Cry 4, you can "finish" FC5 in just a few minutes if you choose not to do anything during the intro. But by throwing players into an open-world sandbox, Far Cry 5 casts its narrative direction by the wayside. Although your goal is to kill Seed's three generals (one in each of Hope County's different biomes) before capturing the cult leader, the storytelling quickly takes a backseat. Weird, they did something similar with the progression in Wildlands. Hopefully it's not like the "climb the tower" thing that was in every open world Ubisoft game. I had more fun doing the side quests in FC4 than playing the story. Reviews are interesting to read but do not mean anything to me when it comes to Far Cry games. I know what I want the game to be and that is what we are getting. I knew that some people would like have some opposition to this game simply because it tells a story that takes place in America where you are taking out some Americans. I am curious, are they releasing a physical copy of FC3 for the PS4, or is it going to be download only? I would guess download only. It's part of the Season Pass. The Stick of Truth was a digital giveaway with early purchases of The Fractured But Whole, and Ubi gave it a physical release on the XB1/PS4 after a few months, so it wouldn’t surprise me if they did the same with FC3. Surprised reviews are all over the place for this. I wonder if losing the hunting/crafting aspect made it feel like too much of a departure for most people?